While visiting the Strandfontein Settling Pools, we saw these enormous birds that seemed at first to be over-sized seagulls. 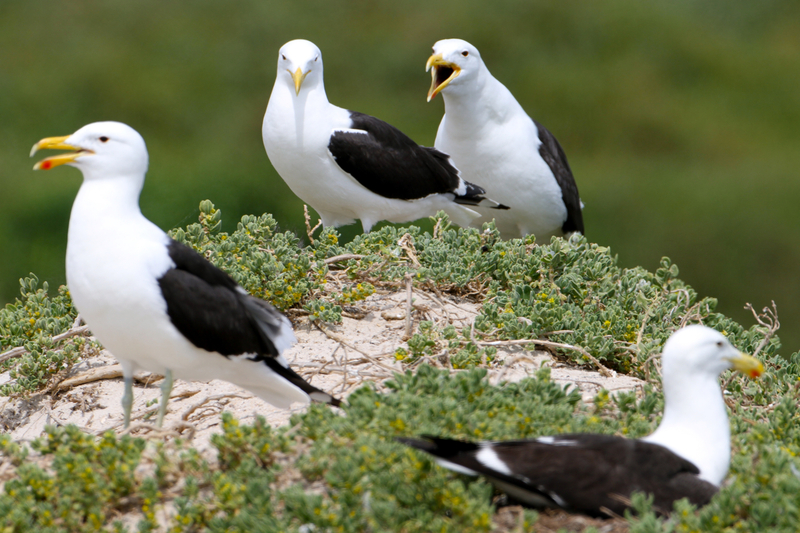 They were, in fact, kelp gulls (Afrikaans name, Kelpmeeu). 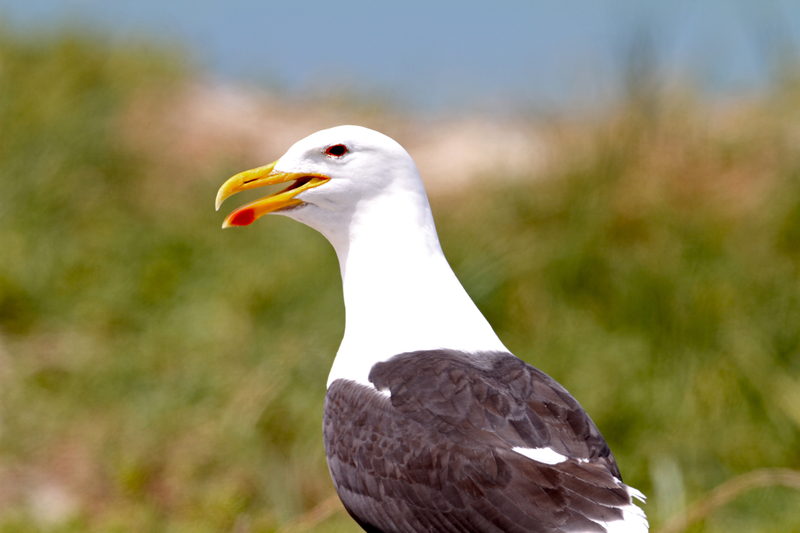 To give you an idea of their size, and ability to protect themselves, have a look at this beak. It’s bigger, thicker and longer than a seagull’s beak and the birds have some mighty power in those stocky bodies of theirs. You’ll understand why this is important in a moment. At one point, we came across a huge flock of these gulls and decided to park the car so that we could get closer to the birds. 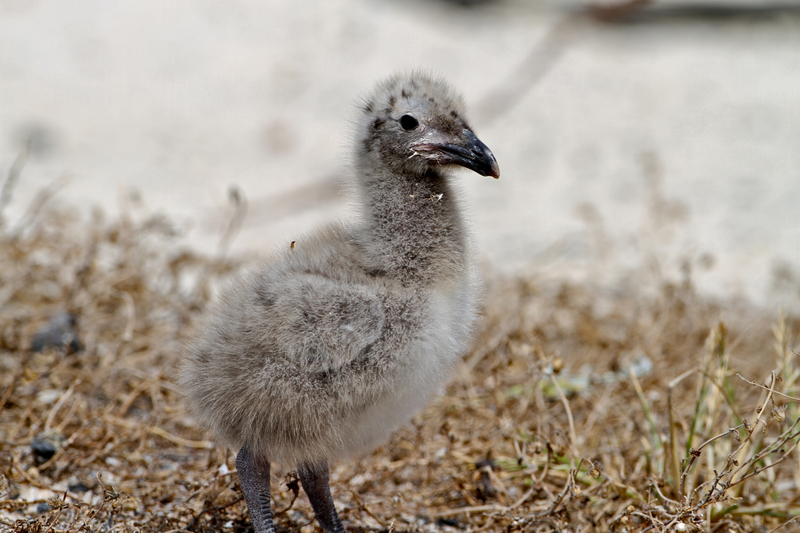 We ventured over the dune to find an entire colony, with hundreds of birds … and their newborn chicks! As we got closer, the gulls squawking got louder and louder and LOUDER. What began as plain shouting (as you can see above) then escalated into fake dive-bombing. Fake only because the birds would swerve back up before actually hitting us. That lasted for about 60 seconds before the real dive-bombing began. I was only hit once on my head but it was hard and sharp enough to send a strong and simple message: get out of here! We quickly took a few more photos before beating a hasty retreat. 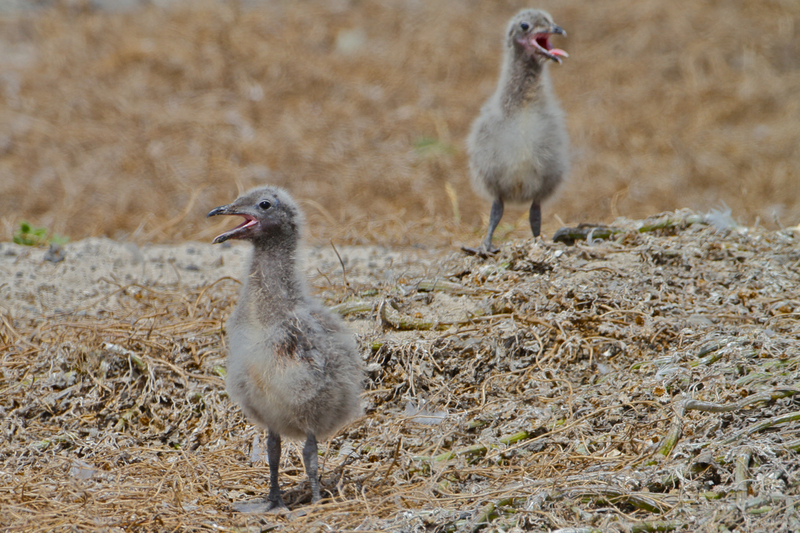 We didn’t set out to frighten any of the moms or chicks, and the sooner they returned to their natural comfort the better. Though the fighter planes putting targets on our heads could’ve had something to do with our decision to leave too. And who could blame the dads for wanting to protect their families? Just look at how cute these little guys are. On our way out, we spotted two nests filled with eggs. We couldn’t help but take one more photo before dashing to the car. What an amazing adventure – and just 20 minutes from Cape Town. 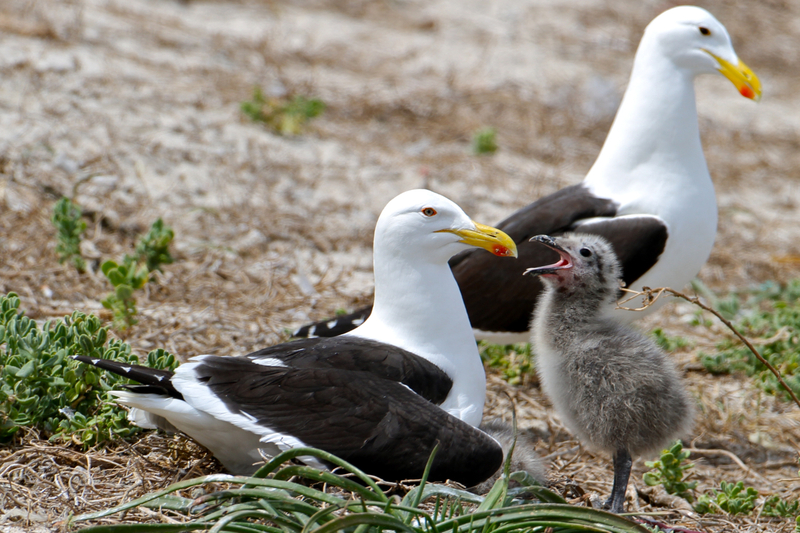 Are sea gull eggs protected from picking? To eat? 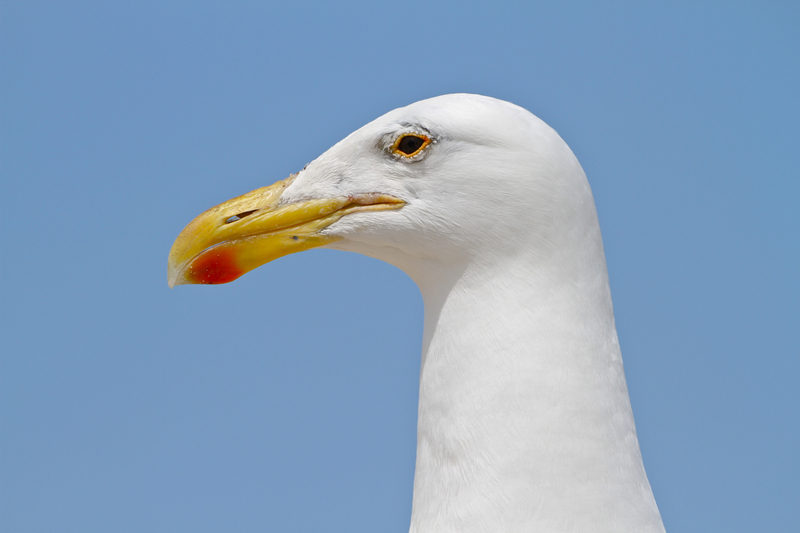 In South Africa you would not be allowed to take Sea Gull eggs.